Eva Bosch is a Catalan painter born in Barcelona. 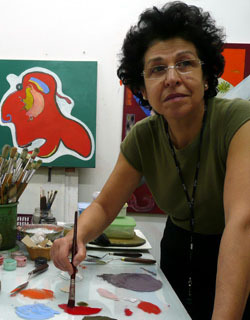 At present she lives and works in London with regular sojourns in her atelier in Montmany-Figueró (Barcelona). She combines her studio work with lecturing in the history of Art. Since my arrival to the United Kingdom in 1973, I benefited from several awards and scholarships provided by a generous, now long gone, British welfare state. I obtained an M.A in fine Art Painting at the Royal College of Art where I was granted an award to study at the Rijksakademie van Beeldende Kunsten in Amsterdam. In 1995 I won the Pollock Krasner Award. I have had residencies in Italy, France, Spain and Taiwan. In the last fifteen years I have researched prehistoric painting in Europe as well as in residencies in Senegal and Turkey. In Catalhöyük, www.catalhoyuk.com a city in Anatolia dating from 9000 years ago, I worked next to archaeologists and scientists. The study of prehistoric paintings has reinforced my belief that the urge of mark making does not change through millennia. The marks left behind by an individual portray a moment in time expressing an emotion or a need. What gives them value is the feeling they arouse which is universal, but like fingerprints is different for every viewer. The post-modern world is saturated with highly sophisticated technology. As a result, the modern artist faces an immense challenge. Read Commentary on Eva Bosch by Matthew Tree, Anglo-Catalan writer living and working in Barcelona.